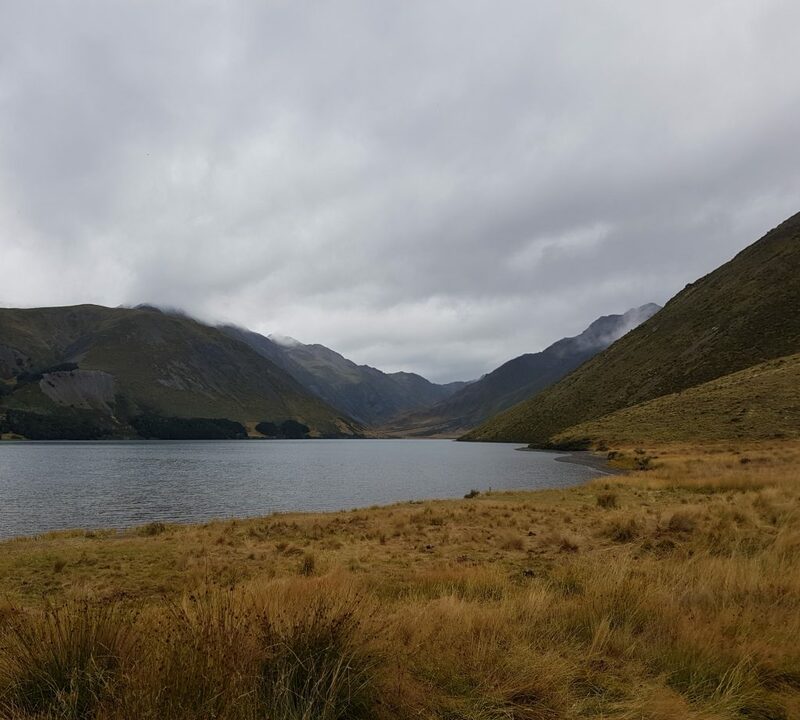 We had taken in the Hanmer Plain and conquered the most popular peak in Canterbury, so now it was time to move on. 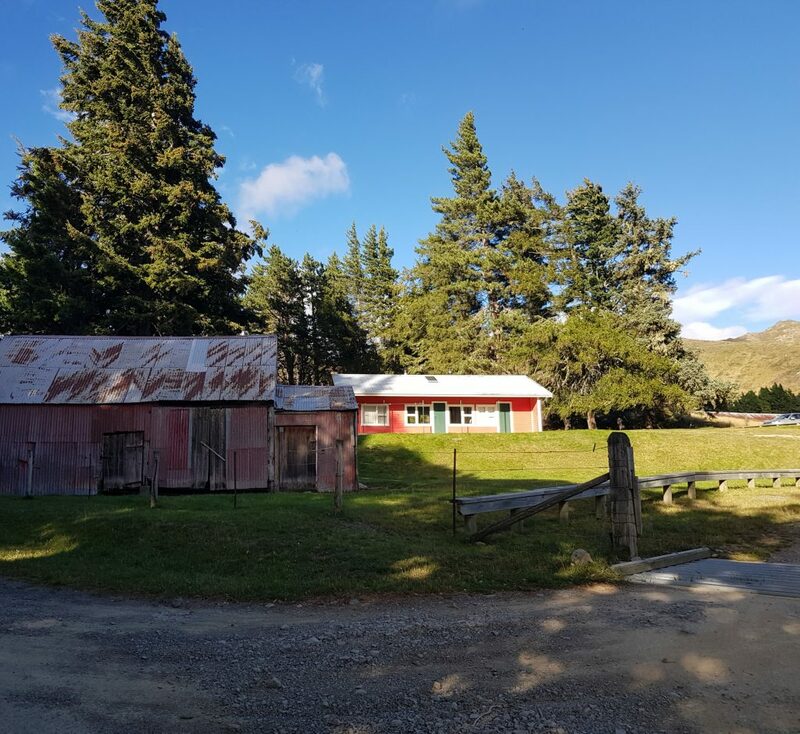 We were aiming for the Tasman region, but no highways for us – I was determined to reach it via a far more adventurous route. 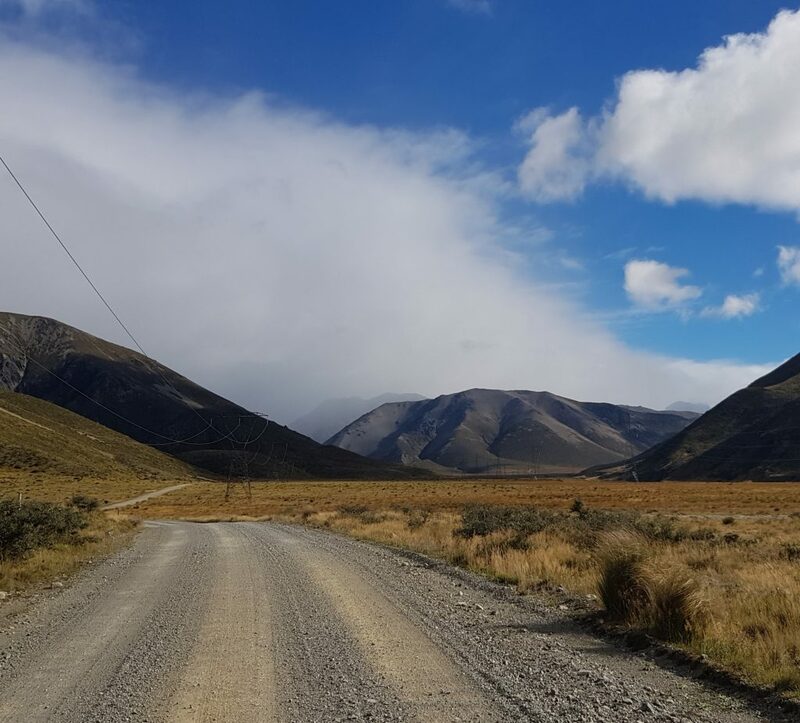 We headed up Clarence Valley Rd and beyond our previous exploration limit of Jacks Pass, into the great glacial valleys beyond. 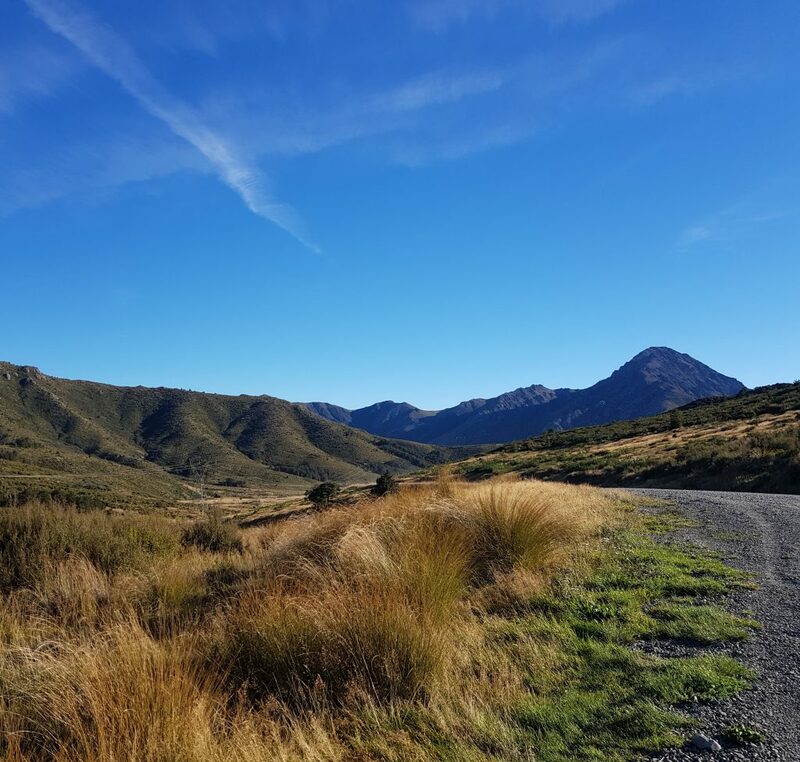 We were now tracing the boundary between the St James Conservation Area and Molesworth Station, both now managed by the Department of Conservation. I chose to delay the choice briefly, as I’d read that the Clarence River contains prize-sized trout, and its sinuous glittering waters were too attractive to pass up. I pulled off the road, only to discover that what I’d thought was the solid shoulder of the road was actually a deep muddy ditch. Our vehicle sunk in deep, and the wheels spun helplessly as I attempted to reverse back out of the mess. Dad jumped out of the car, and with the wisdom of many years of experience, directed me as I tried forward, back, left and right until finally the straining vehicle roared back onto the gravel road. Disembarking myself, I saw that the mud had reached above the running board, a scary sign of how close I’d come to utter disaster. If we hadn’t managed to get ourselves out of the mess I’d gotten us into, we’d have been stuck waiting for someone else to pass by in this remote land of no cell reception. Nevertheless, I was ready to turn my luck around with a prize trout – only I couldn’t find any of my lures! Turns out they were still in Dunedin, which meant Clarence River would remain unfished today. Frustration running high, I restarted the vehicle and continued along Tophouse Rd until we had reached the St James homestead and ski field turn off. Three historic buildings remain here, tentatively dated to the 1880s when two Scottish brothers, Duncan and John McArthur, purchased the run. These are the woolshead, cook house (which would have been important to feed the many men employed at mustering-time), and stable. Scattered around are also numerous old dog kennels for the musterer’s hounds. Poking behind one of the buildings, I found what remains of the homestead itself, which burned down in 1947. 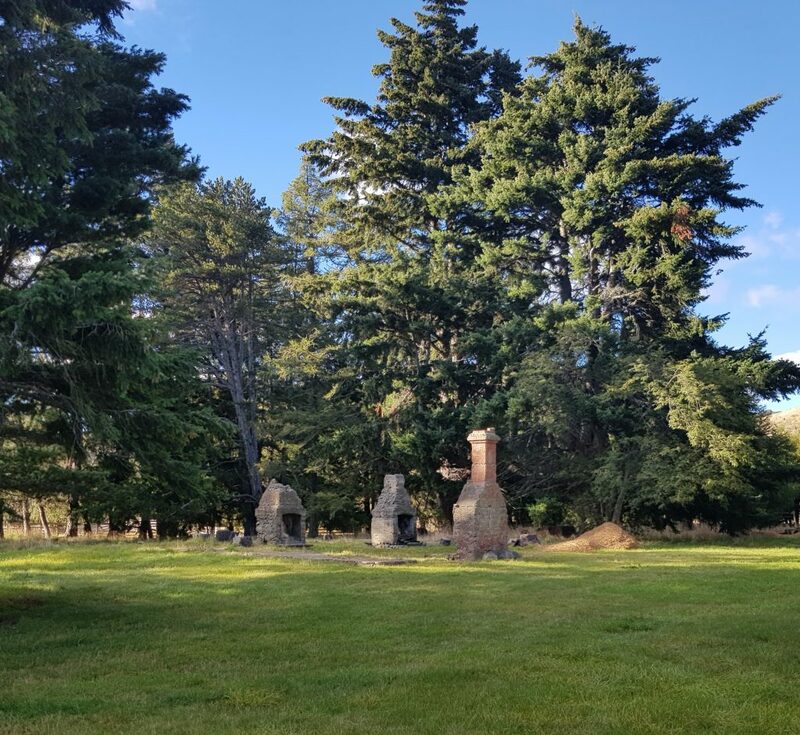 These chimneys were apparently damaged in the 1888 North Canterbury earthquake, which also knocked the top 7.8m off the spire of ChristChurch Cathedral. 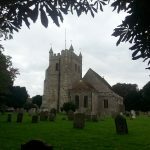 I didn’t take more than a quick look – the rest of our journey was waiting! 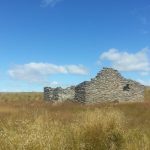 We followed the Clarence along its glacial valley, awed by our ever-more-grand surrounds – golden grass and steep rocky slopes. 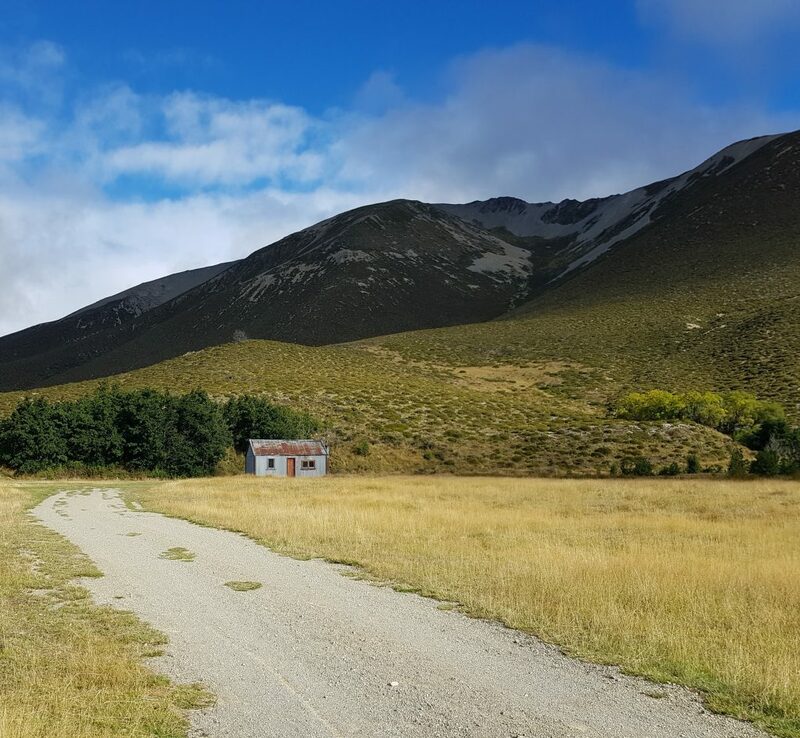 Only hardy vegetation can grow here, like the matagouri which was one of the only fuel types available for the hardy men and women who travelled and lived in this region. Now bound almost due north, we soon came upon Fowlers Hut standing guard at the trailhead for the Fowlers Pass track, splendid in its isolation. William Langley Fowler was an 1860s settler who made his home in Stanley Vale, up and away at the far end of that narrow and difficult route. If you had asked the McArthur brothers what sort of neighbour William made, they might have made some pointed comments about sheep-stealing. These large runs weren’t practical to fence, so it was inevitable that run holders would occasionally find themselves in possession of their neighbour’s sheep at muster time, which would then generally be released or returned to the correct owner. But according to the McArthurs, such sheep that ended up in their neighbour’s possession instead had their marks altered to look like his own. The allegations, however, were not proven in court. Stanley Vale was later incorporated into the St James Run. This hut, despite its name, was not in fact one of Fowler’s, although it was on his land. It belonged to a rabbiter, Henry Barker, and his wife. Onward again, and I was beginning to become concerned by the low dark clouds that were crowding into the valley up ahead. The weather can be extremely rough out here, with early stories speaking of snow storms that killed tens of thousands of sheep and snow so thick that the only way out to Hanmer was along the stream bed, with snow banks on either side looming above the heads even of men on horseback. Nevertheless we forged on, eventually locating the turn off for Lake Tennyson. By now the blue sky had disappeared and the threatening clouds were looming low over our head. But as we approached the lake, something incredible happened. For a breath of time a perfect rainbow arched over the tussock before us, fading away as quickly as it had appeared. This is how the New Zealand wilderness stole my heart. It may be frustrating, inhospitable, and sometimes deadly, but nothing can compare to these moments of transcendent beauty. We pulled up beside the lake and dashed with our billy and stove through the drizzle to the safety of the nearby shelter. As the water heated, we perused the interpretative signs telling of the early rabbiters and their hard lives. Rabbits arrived in the district around 1858 and quickly became a scourge on these large runs, causing erosion and vegetative ruin that drastically decreased the land’s stock carrying capacity. Some run holders were completely ruined, here and in Otago – rabbits were blamed for John Cargill (of Tunnel Beach fame) leaving New Zealand. Desperate times called for desperate measures, and when bringing in a cartload of cats didn’t work, a 120km rabbit proof fence was commissioned, to stretch from west of here all the way to Culverden. Rabbiters were employed to patrol and maintain the fence, including those stationed at Fowlers Hut. Parts of it still exist, including a portion here near the outlet where Lake Tennyson drains into the Clarence River. Unfortunately it didn’t work, and rabbits are still a pest we struggle with today. Once we’d had our warming beverage, we left the lake and pressed on into the wilderness. 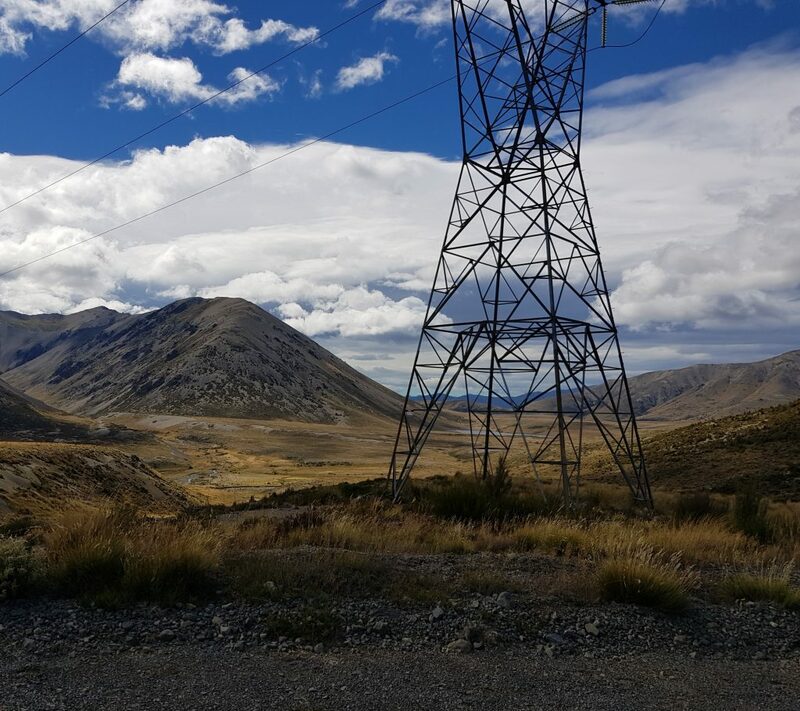 We were now in Molesworth Station proper, following the Wairau-Hanmer Springs Hydro Road and the rows of immense pylons it services. 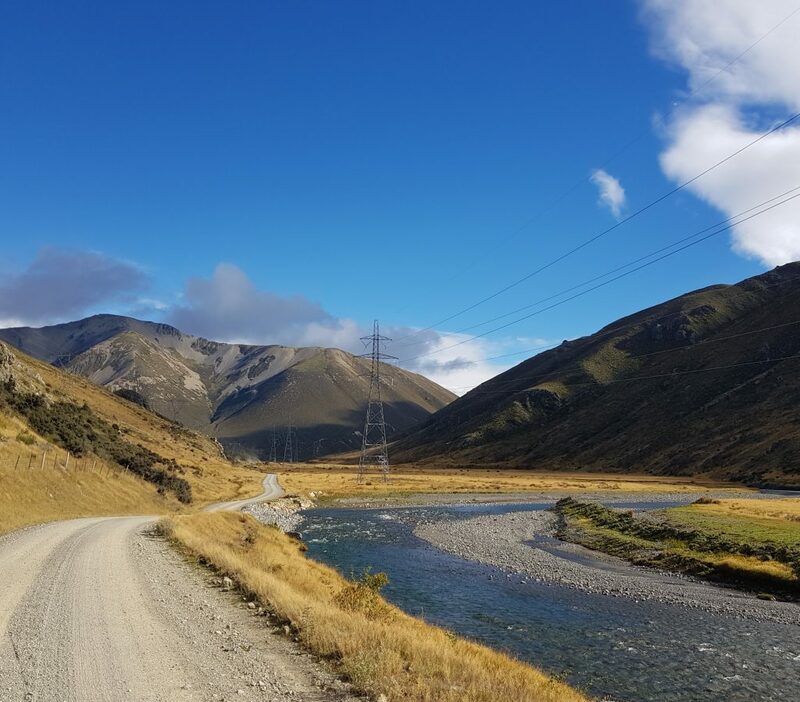 Two lines run along this route – the first installed in 1958 to supply power to Nelson and Marlborough, and the second built in the 1960s to bring power north from Lake Benmore to the terminus of the undersea cable that crosses the strait. We now followed the pylons up a steep slope, weaving around the curvature of the hills while they took a more direct route. 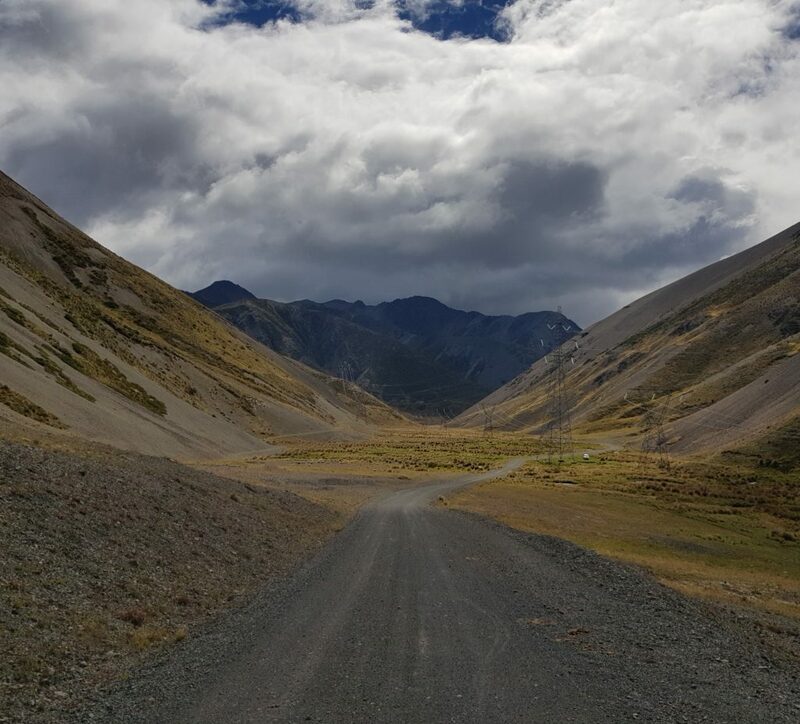 We were approaching the 1437m Island Saddle, said to be the highest point on any publicly accessible road in New Zealand. On our way over, we were watched by a few scattered beef cattle, which have now replaced sheep on this, the biggest farm in New Zealand, which is administered by the Department of Conservation. The sheep-farming run holders walked off the land back in 1938. 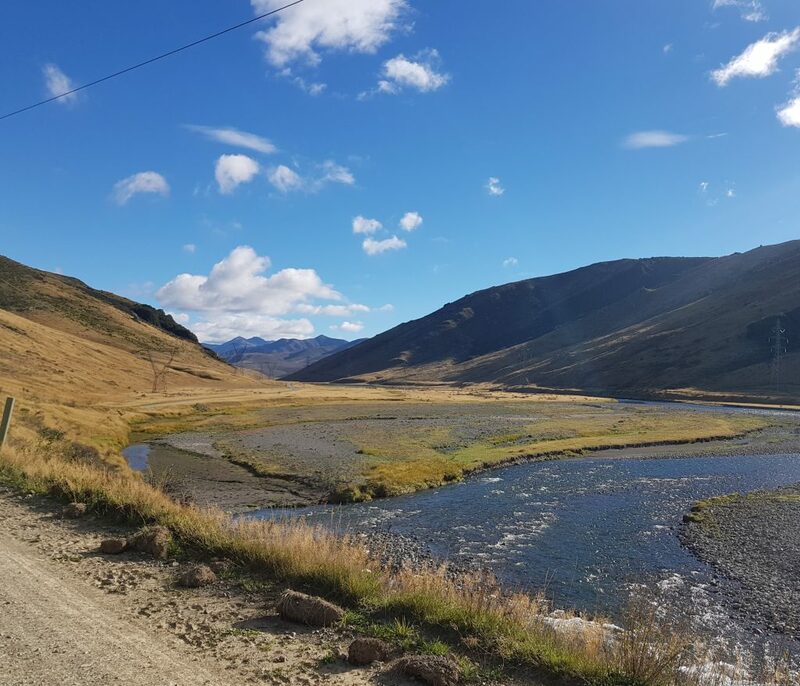 We had now crossed the boundary between Canterbury and Marlborough and the watershed between the Clarence and Wairau Rivers. The sun had returned and all traces of the threatened storm were gone. 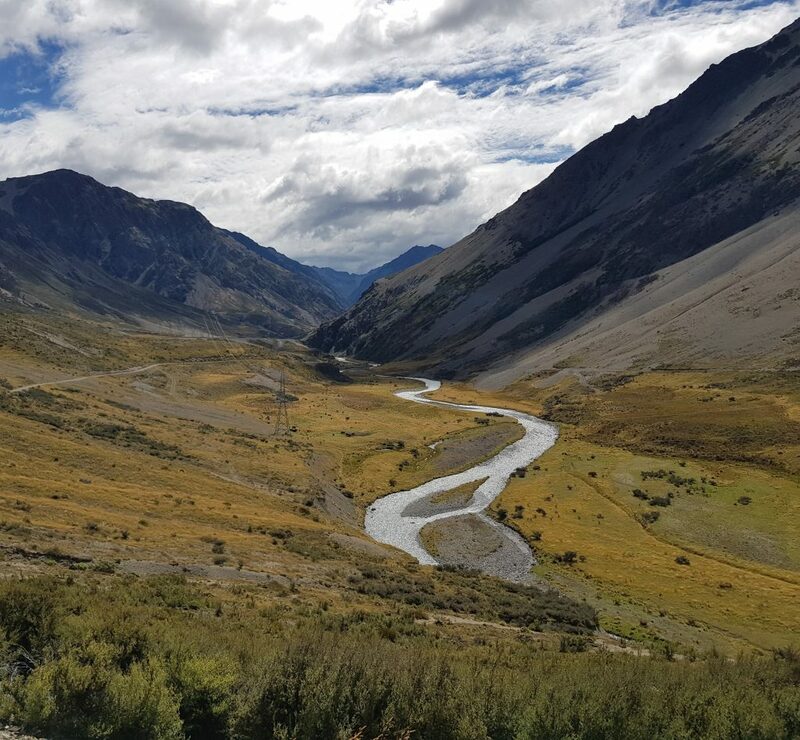 We paused on a ledge overlooking Sedgemere Lakes, a boggy alpine flat supporting several glacier-carved lakes, and a haven for rare plant and animal life. Then we carefully continued along the rough and narrow road, huddled between scree-shaped heights and the drop to the valleys below. 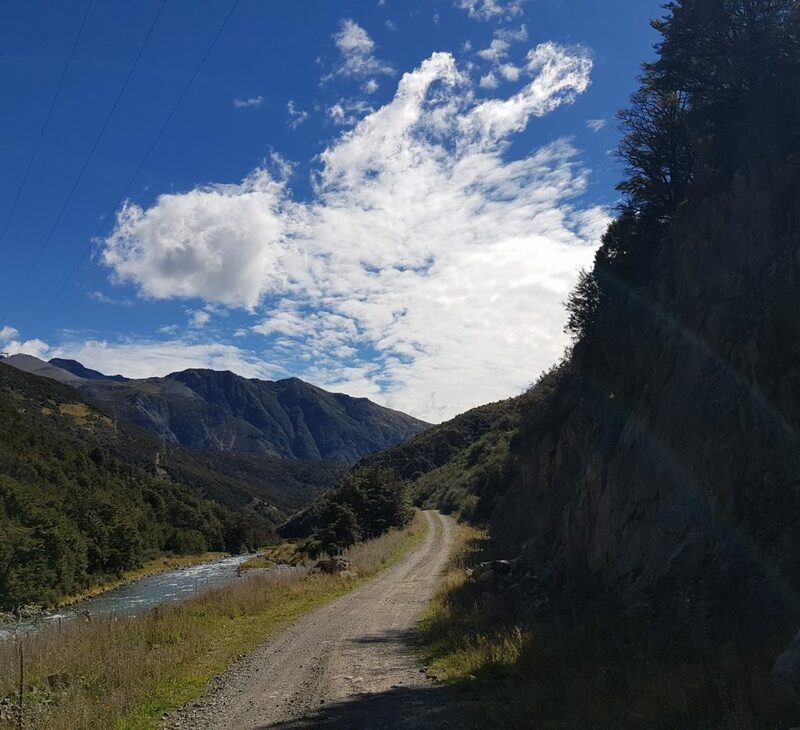 Rounding another bend, we paused once again to view the sinuous trail of the Wairau and our road ahead. Not long after we came to a sign indicating that we were about to enter the Rainbow Station and its famously difficult road. Multiple warnings cautioned us not to attempt the crossing without a four wheel drive and adequate preparation. We drove on, into the teeth of Hells Gate. The road through the deep gorge was indeed rough, with tight bends and fords and ruts that rattled our bones – but nothing I couldn’t handle after crawling out of the mud earlier! We emerged from the gorge into slightly more hospitable land, scattered with small patches of beech forest. 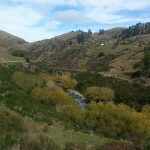 Our route took us through a wide valley and across the Wairau more than once. We eventually pulled up to the Old Paradise Homestead and paid our $40 toll under the watchful eyes of the toll goat. 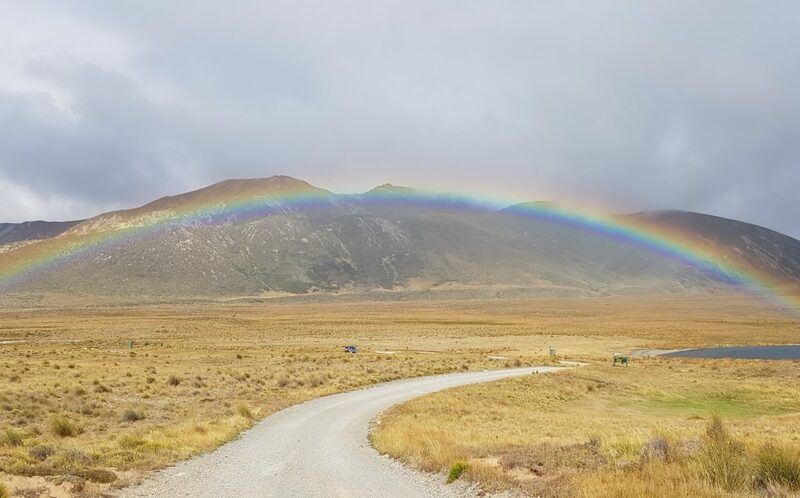 We passed by the Rainbow Ski Area turn off, beyond which we finally found the first paved road we’d seen since Hanmer Springs! We’d conquered the crossing, no worse for wear aside from the layer of dust and mud coating the vehicle. You have some excellent photographs there.